One of my favorite meals to make on a busy weeknight is prepared chili, that is, prepared by someone else. Recently, there has been a lot of press about BPA or bisphenol A, a compound found in plastics and aluminum cans. Since it exhibits hormone-like qualities and has been linked to a variety of health problems including recent correlations to hyperactivity and obesity in children, I've been trying to find alternatives to products I used to buy in cans like chili and soup. So, when I discovered The Better Bean Company, a company making skillet sauteed, prepared beans packaged in BPA-free packaging, I was thrilled. 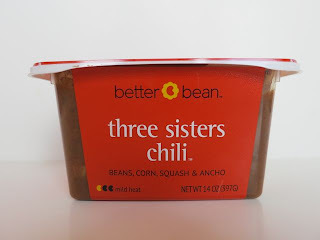 One of their products, Three Sisters Chili, had me most intrigued as it is one of the ones that you can eat right out of the package. Just heat and eat! I heated the chili up for a quick lunch and was very pleased. 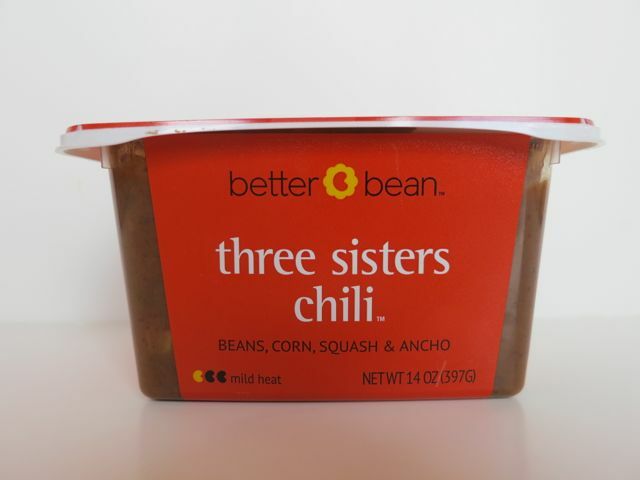 The Three Sisters Chili is named for three companion plants of Native American agriculture--beans, corn, and squash. This chunky chili has both red and black beans along with tomatillos, corn, squash, poblano peppers, and yams. It is a mild chili and since I prefer a lot of spice, I reached for some hot sauce to add a little kick. You could also top it with cilantro, green chilis, or green onions to add another fresh component. Other ideas include using it in a 7-layer dip, on baked potatoes, or as a component to a lovely, cheesy, beany nacho dish! The only thing I wonder about is whether the corn in this chili is GMO or non-GMO as I try to avoid genetically modified organisms as much as possible these days. With such an environmentally and health-conscious company, I'm hoping they will get certified by the Non-GMO Project soon. UPDATE: As you will see in the comments below, they are currently pending Non-GMO Project verification. 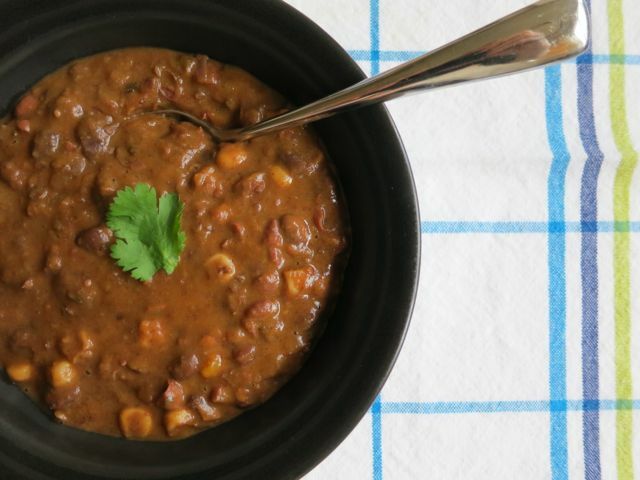 The chili sells for under $4 per package and is a quick, easy, healthy lunch. To find out where these products are sold, click here. Hannah from Better Bean here. We are very close to being officially Non-GMO project verified. The corn we use is grown and processed (we buy it frozen, so it is local all year round) in Oregon by Stahlbush Island Farms. It is Organic and each field is tested to ensure there is no cross-pollination with GMO corn. Thanks for your concern! We need to spread the Non-GMO message far and wide. It is crazy how much GMO corn (and GMO soy for that matter) are used you can find corn as filler in pills and the soy in breads and almost all processed meats. Thank you so much for letting me know. I'm so glad to hear you are getting Non-GMO Project Verified! But, not at all surprised considering your health conscious company values. Thank you for being so conscious and for offering such awesome healthy options!